It’s a birthday movie marathon! Well, not today, but on Sunday, Turner Classic Movies is having a movie marathon in honor of the birthday of legendary comedian Danny Kaye. You might know him as the-other-guy-who’s-not-Bob-Hope in “White Christmas” with Bing Crosby. If you know him from any of his own movies, color me thrilled. And today’s special feature is, in my opinion, the best of his best. The throne of medieval England has been usurped! A competing family has murdered the royal family and taken over rule of the kingdom. The only survivor is a small infant, being hidden away by rebels fighting the traitors. Hawkins, a runaway circus performer, (Danny Kaye) is part of the rebel group, but unfortunately the only way they let him contribute is by providing entertainment to the men between battles….and performing duties that involve the infant king, and his diapers. But one day, he and Captain Jean (Glynis Johns) are transporting the infant king to a safe house, when they encounter the new court jester to the royal court. Jean convinces Hawkins to steal the jester’s rig and go in his place. Once he’s inside the castle, he can open a not-so-secret tunnel that will let the rebels sneak in and overthrow the traitors! Easy as pie! And since Jean is pretty, and Hawkins wants to prove himself – oh, and she’s agreed to marry him if they ever put the rightful king back on the throne – he agrees. Unfortunately for Hawkins, he has walked into a royal hornets’ nest. There is intrigue and conspiracy on all sides, and it turns out that the new jester was secretly supposed to fill different roles to different people – entertainer, lover, assassin. And Hawkins has to pull it all off perfectly to maintain his cover. There also happens to be a witch in the castle, who picks the most inconvenient times to hypnotize Hawkins to carry out her own errands. And to top it all off, somewhere along the way, Jean gets picked up by soldiers to come be a pretty room ornament at the castle party that night. 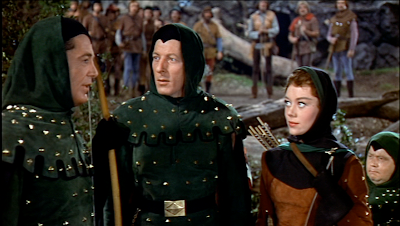 Before long, Hawkins is not just juggling to entertain, he’s trying to pretend to be a fool to the king, a steely-eyed killer to the king’s advisor (Basil Rathbone), and a dream come true to the princess (Angela Lansbury). Can he pull it all off, overthrow the evil fake king and win Jean in the end – without getting them all killed? In my opinion, this is Danny Kaye’s best movie. It showcases nearly all of his greatest skills: singing, dancing, cutting wit, complicated tongue twisters, multiple fake foreign languages, and physical comedy, all feeling totally improvisational. It lacks the heavy drama of “The Five Pennies” or “Hans Christian Anderson,” but then this movie doesn’t call for it, and it isn’t missed. 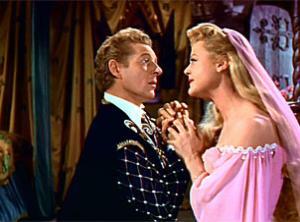 I love Danny Kaye and this movie!